Summer Creek Station is well located at the intersection of Chisholm Trail Parkway, Summer Creek Drive and Sycamore School Road. After several sales, Legacy just has a 1.3 acre retail pad site remaining to sell. Legacy has previously sold sites for a Walmart Neighborhood Grocery, a multi-use retail center, a 7-Eleven convenience store, and a multi-family development that includes a retail component. The developer of the multi-family project has an additional 22 acres under contract to buy in 2019. 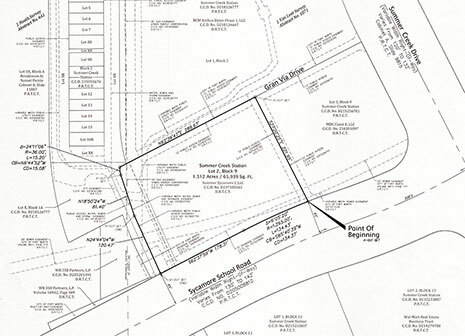 The pad site on Sycamore School Road is zoned and can accommodate retail use.